Organized by the Muscarelle Museum of Art at the College of William & Mary, Williamsburg, Virginia, The Tsars’ Cabinet at the Museum of Russian Icons, is the traveling exhibition showcasing more than 230 objects that exemplify the craftsmanship of artisans under the Romanov tsars. A feast for the eyes, the exhibit features decorative arts dating from the reign of Peter the Great to that of Nicholas II. From richly ornate table services designed for coronation banquets to jewel-encrusted personal items, the spectacular objects in The Tsars’ Cabinet reveal the extreme extravagance and luxurious lifestyle of the Romanov reign. 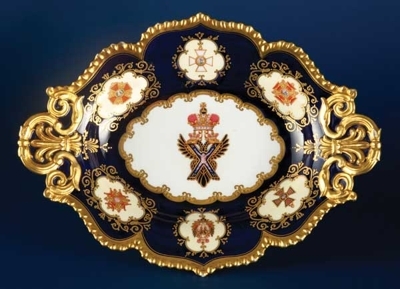 Many of the pieces were made for the ruling tsars and their families. The exhibit includes objects produced by the Imperial Porcelain Factory in St. Petersburg, one of the oldest porcelain factories in Europe, as well as wares made by the Imperial Glass Factory in St. Petersburg and examples of intricate enamel work from renowned firms such as Fabergé and Ovchinnikov. The Muscarelle Museum of Art is located on the campus of The College of William & Mary in Williamsburg, VA. A culturally-rich art institution, the museum serves as a dynamic resource for the local community, a working laboratory for the College, and a platform for visiting exhibitions and the museum’s own collection. Visit http://web.wm.edu/muscarelle. The Museum of Russian Icons collection of more than 700 Russian icons and artifacts is the largest of its kind in North America, and one of the largest private collections outside Russia. Spanning six centuries, the compendium includes important historical paintings dating from the earliest periods of icon “writing” to the present. The Museum was founded in 2006 as a nonprofit educational institution by Massachusetts industrialist, philanthropist and art collector, Gordon B. Lankton. This entry was posted on March 14, 2014 by Nery in 2014.